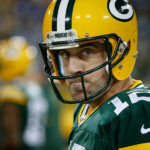 Photos from the Green Bay Packers vs Denver Broncos NFL Football Game. 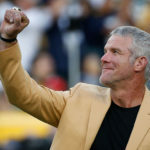 The Green Bay Packers defeated the Denver Broncos 49-23 on Sunday, October 2nd , 2011 in an NFL football game to go 4-0. 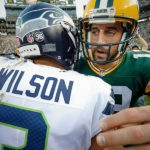 Quarterback Aaron Rodgers threw for four touchdowns and rushed for two more. Covering the game I need to get the usual game telling action shots, but for this game I also needed to include the pink ribbons on various items from the game balls to towels. The ribbons are for National Breast Cancer Awareness Month. 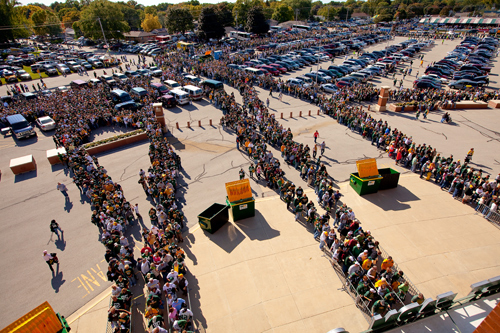 Before kickoff I got a call that the new security measures were causing some very long lines outside of the stadium. I was able to get to the top level of the stadium and get some telling over all shots of the long lines. 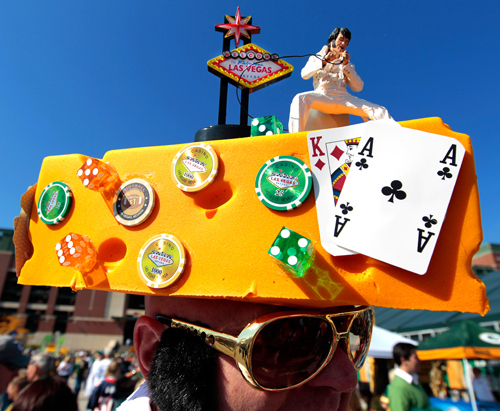 A cheesehead wearing Elvis enjoys a little tailgating. Fans wait in long security lines due to increased security measures. Packers Aaron Rodgers and Dancing with the Stars Donald Driver do a little dance during player introductions. 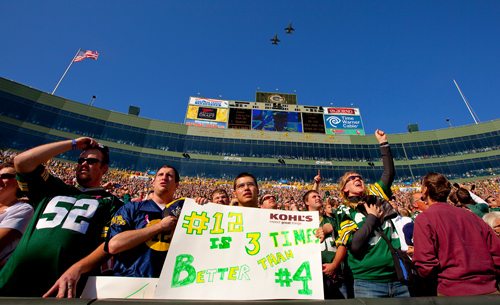 Fans cheer during a flyover at Lambeau Field. Green Bay Packers wide receiver Greg Jennings pulls in a pass as Denver Broncos defensive back Jonathan Wilhite defends. The Green Bay Packers defense sacks Denvers quarterback Tim Tebow. Donald Driver celebrates a touchdown with Green Bay Packers Jordy Nelson. A referee holds a game ball with the pink breast cancer ribbon. Denver Broncos wide receiver Eric Decker celebrates a touchdown. 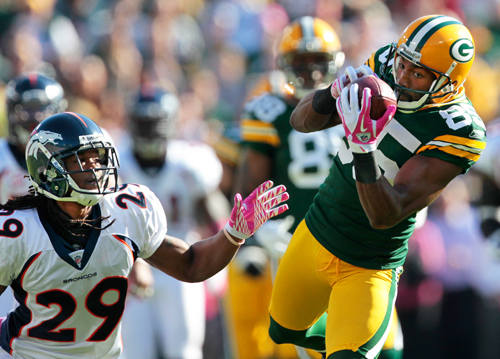 Denver Broncos wide receiver Brandon Lloyd pulls a pass in as Green Bay Packers strong safety Charlie Peprah defends. 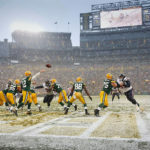 Denver Broncos quarterback Kyle Orton runs away from the pressure of Green Bay Packers outside linebacker Clay Matthews. Denver Broncos wide receiver Eric Decker celebrates a touchdown with his teammates. 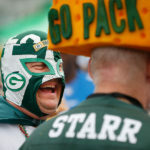 By the look on his face it's tough to tell that Green Bay Packers wide receiver Greg Jennings just scored a touchdown. Green Bay Packers tight end Jermichael Finley gets tripped up by Denver Broncos defensive back Jonathan Wilhite (29) and linebacker D.J. Williams (55). 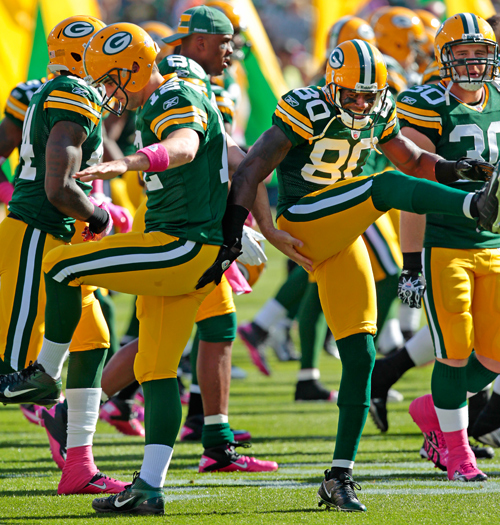 Green Bay Packers quarterback Aaron Rodgers scores his second rushing touchdown of the day. Green Bay Packers quarterback Aaron Rodgers signals touchdown as he waits for a booth review on his second rushing touchdown of the day. Denver Broncos quarterback Kyle Orton looks for a receiver. Green Bay Packers quarterback Aaron Rodgers and guard T.J. Lang celebrate a passing touchdown. Green Bay Packers inside linebacker Desmond Bishop sacks Denver Broncos quarterback Kyle Orton. Denver Broncos defensive back Jonathan Wilhite pulls in an interception that bounced off of Green Bay Packers wide receiver James Jones. Green Bay Packers cornerback Sam Shields grabs an interception as Denver Broncos wide receiver Brandon Lloyd looks on. Green Bay Packers cornerback Sam Shields runs back an interception. Green Bay Packers running back James Starks breaks through a hole. Green Bay Packers wide receiver Donald Driver does a Lambeau Leap to celebrate a touchdown with fans. Green Bay Packers defensive back Jarrett Bush takes down Denver Broncos wide receiver Eric Decker. Green Bay Packers inside linebacker Desmond Bishop celebrates a defensive stop. Green Bay Packers quarterback Aaron Rodgers and offensive guard Josh Sitton smile as they walk off Lambeau Field on Sunday October 2nd, 2011 after defeating the Denver Broncos 49-23. « Happily Ever After Animal Sanctuary.